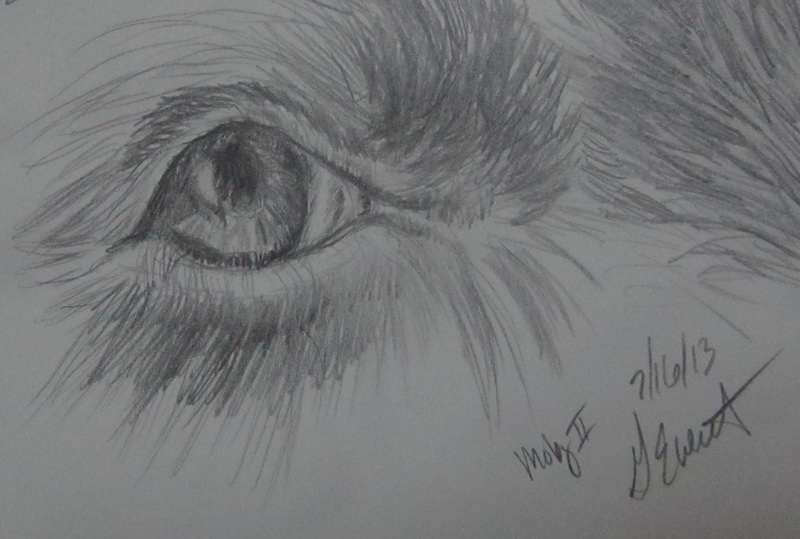 Another Moby dog eye sketch from last night. I spent the day cleaning and disassembling my dad’s work room and made some serious progress. His studio space and my sister’s old room are empty! (For those who don’t know me, I’m in the process of clearing out my parents house after their deaths) Last night I felt drained and my body & feet ached, but I forced myself to sit down and create something. This might be my new form of art therapy, making myself do a small drawing a day. The weather has finally cooled down and we had threats of thunderstorms yesterday. All I experienced was rain, nice clouds and higher humidity.Today, I’m looking forward to meeting up with an old friend for coffee and spending the day coordinating more house stuff from 50 miles away. Oh, and trying to figure out what happened to my old computer…. it’s seriously not working right! Argh! It’s always something…. Oh, if you want to see images of Moby, just check the Furballs & Feathers page. I have images of my current critter load there.